This edited volume provides an overview on US involvement in Iraq from the 1958 Iraqi coup to the present-day, offering a deeper context to the current conflict. 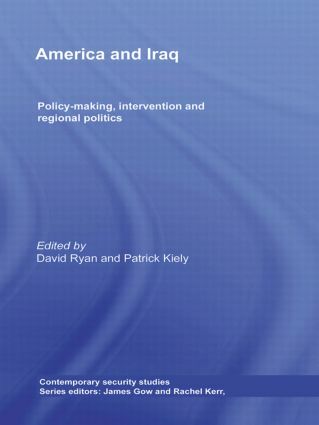 Using a range of innovative methods to interrogate US foreign policy, ideology and culture, the book provides a broad set of reflections on past, present and future implications of US-Iraqi relations, and especially the strategic implications for US policy-making. In doing so, it examines several key aspects of relationship such as: the 1958 Iraqi Revolution; the impact of the 1967 Arab-Israeli War; the impact of the Nixon Doctrine on the regional balance of power; US attempts at rapprochement during the 1980s; the 1990-91 Gulf War; and, finally, sanctions and inspections. Analysis of the contemporary Iraq crisis sets US plans against the ‘reality’ they faced in the country, and explores both attempts to bring security to Iraq, and the implications of failure.